Do you have big plans for the long weekend? I really don't, but I do have a patriotic tablescape in my dining room to enjoy for a few days. 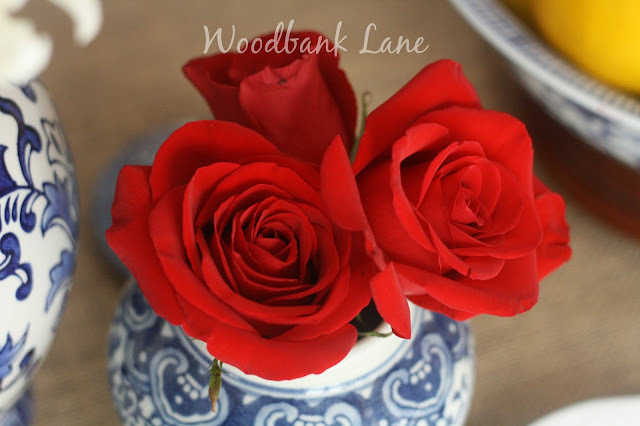 I'm showing it to you today and sharing the easy process for setting a holiday table--or any table for that matter. When setting a holiday table, the colors are usually predetermined--red, white, and pink for Valentine's Day; shades of green, red, and maybe blue for Christmas; red, white, and blue for Independence Day, and so on. But if you're just wanting to smile when you walk through the dining room, pick colors related to the time of year or think about what family event you have right around the corner. 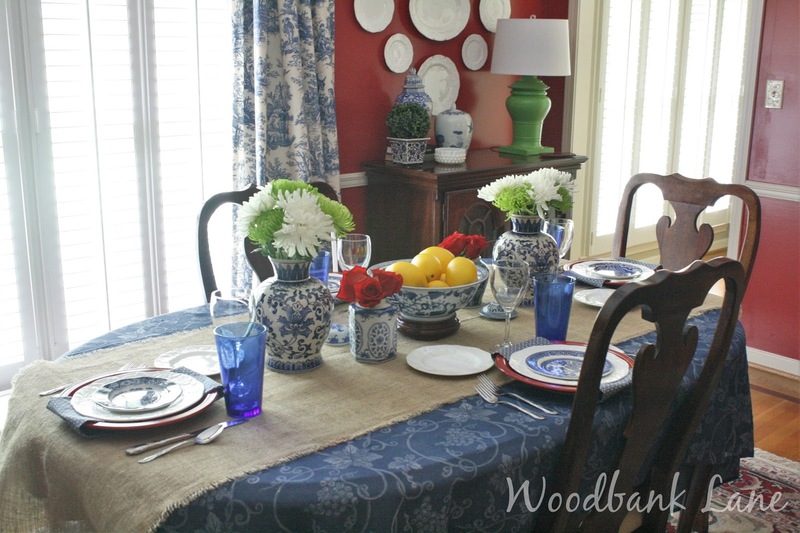 For my July 4th table I used a blue patterned table cloth and layered it with a burlap runner for texture. 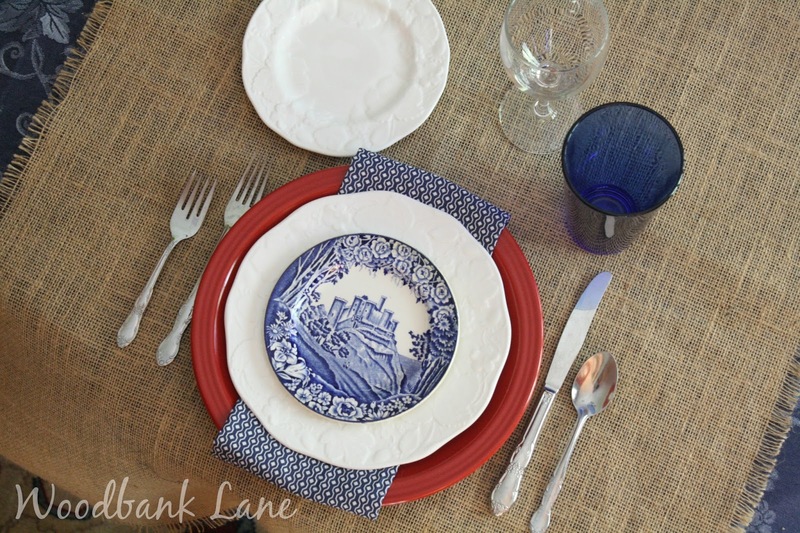 If you don't have a table cloth, place mats work and are a good way to add pattern. I wanted to incorporate all three patriotic colors on the table. My plates from Target that we use everyday supplied the red. The white is my Wedgewood Strawberry and Vine that I've had forever. . .
. . .and for the last plate, I used blue and white transfer ware picked up over the years from various thrift stores and antique shops. I tucked a napkin neatly into the stack, added a water stem and a blue tea glass (they were my grandmother's), and a bread saucer to finish the plate setting. Once everything had a place, the only missing details were flowers which my local Publix provided for $12.00. The faux lemons are from another part of the house. I borrowed them to add an additional color to the mix. Think of your table as a canvas. Mix and match, arrange and rearrange until it's just the way you like it. I hope you all have a wonderful 4th of July holiday!